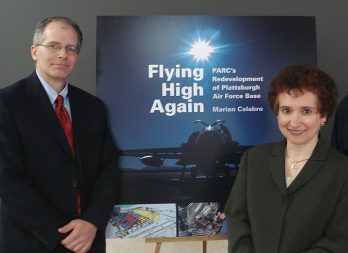 PARC CEO Bruce Steadman with Marian Calabro, author of Flying High Again: PARC’s Redevelopment of Plattsburgh Air Force Base, published by CorporateHistory.net. Thank you again for your expert consulting on Grey’s centennial book project. Your help allowed us to get started when we didn’t know where to begin. As you know, creating a book is a big job even for people who know what they’re doing, but it’s even more difficult when it’s all done in-house. The final product is as big and beautiful as our CEO and team wanted it to be. We all enjoyed working with you, and the final product is outstanding. CorporateHistory.net was invaluable to us in the process of collecting our history and then presenting it to the world. Their experience with this kind of project guided us at every step, and their hard work brought it all to a successful conclusion. We are thrilled with the finished product, and reaction has been nothing but positive. We loved having you write our book. Wish you could have seen our employees’ faces when they saw the book for the first time! Creating a book, especially one that covers 40-plus years of history for four audiences, is no easy task. Yet by working with CorporateHistory.net, it became an endeavor of excitement and love. Marian Calabro was an invaluable organizer and writing partner. She became a friend to Melwood as well, embracing our story as if it were her own. While our book is about business and products, it’s really about people. The process of creating it with CorporateHistory.net was a really neat experience. I genuinely enjoyed Marian’s intelligence, wit, good humor, and especially her patience!